The Skanner News - Former Obama Advisers Say US National Security is "Making Situation Worse"
Former Obama Advisers Say US National Security is "Making Situation Worse"
WASHINGTON (AP) — At the CIA's Counterterrorism Center, it was a cause for celebration: Meticulous intelligence analysis backed by Hellfire missiles had paid off, once again. The CIA launched a drone strike last month on a Yemeni beach at three men it determined were al-Qaida militants. One of them turned out to be Nasser al-Wahishi, about as important a figure as agency man-hunters could hope to eliminate. He had been both al-Qaida's second in command and the leader of the group's dangerous Yemeni affiliate. American officials touted the death as a big victory. But did the demise of another senior extremist, the latest in a long line to be taken off the battlefield, make the United States and its allies any safer? To many experts, including a growing number of former Obama administration national security advisers, that proposition is less convincing by the day. Peace Institute Discussion on Afghanistan: Start the video at 1:00 hour to see former Obama adviser David Sedney. With al-Qaida and the Islamic State group enjoying safe havens across parts of Yemen, Syria and Iraq, and with terror attacks on the rise worldwide, doubts are growing about the effectiveness and sustainability of the administration's "light footprint" strategy against global extremist movements. A template predicated on training local forces and bombing terrorists from the air is actually making the situation worse, some say. Many are arguing for deeper U.S. involvement, if not with regular ground troops, then at least with elite advisers and commandos taking more risks in more places. "What they are doing now is making it more likely that there will be a bigger, more disastrous catastrophe for the United States," said David Sedney, who resigned in 2013 as deputy assistant secretary of defense for Afghanistan and Pakistan. "Drone strikes are not creating a safer, more stable world," Sedney said, and neither is the limited bombing campaign the Pentagon is running against the Islamic State group in Iraq and Syria. Both are creating new enemies, he added, without a plan to defeat them. The New York Times reported Thursday that Islamic radical Seifallah Ben Hassine, founder of the Tunisian militant group Ansar al-Sharia, was killed in a U.S. airstrike in Libya last month. Earlier Thursday, the Pentagon announced that a June 16 airstrike had killed Tariq bin Tahar al-'Awni al-Harzi, an Islamic State group leader who had facilitated suicide bombings. "His death will impact ISIL's ability to integrate foreign terrorist fighters into the Syrian and Iraqi fight," military spokesman Capt. Jeff Davis said. But for how long, critics are wondering, including former Defense Intelligence Agency chief Michael Flynn, who accuses the administration for which he once worked of "policy confusion." Former Army deputy chief Lt. Gen. Richard Zahner says the Obama administration's policy of "benign neglect" toward strife-torn Yemen and Syria has ensured the existence of terrorist safe havens there for both al-Qaida and Islamic State militants. Even Michele Flournoy, the former undersecretary of defense for policy who was the president's first choice to replace Chuck Hagel as defense secretary, wrote last month that the U.S. effort against the Islamic State is "faltering," and urged a more robust approach. "U.S. counterterrorism policy has caused some intense backlash and has had a lot of unintended consequences," said Rosa Brooks, a former Obama administration Pentagon official. Current officials dispute the criticism, but they declined to make anyone available to speak on the record. The administration's position is that the failure of al-Qaida or the Islamic State to launch a coordinated attack on the U.S. homeland is the best evidence that the strategy is working. Timothy Hoyt, a professor of counterterrorism studies at the Naval War College, agreed. Terrorist attacks against the U.S. and its allies have been far less lethal than past campaigns in Britain by the Irish Republican Army, he said, "which suggests that some elements of our counterterrorism strategy are working." It's "absurd," he said, to blame U.S. policy for an uptick in sectarian violence across a Middle East convulsed by political upheaval. Drone strikes have clearly made it harder for terrorists to plan complex attacks, he said. While the strikes create international backlash, he added, there is no evidence they are a driving force in the growth of terror networks. A task force at the Henry L. Stimson Center took a different view in April, raising questions about the long-term effects of killing terrorists with drones. "We are concerned that the Obama administration's heavy reliance on targeted killings as a pillar of U.S. counterterrorism strategy rests on questionable assumptions, and risks increasing instability and escalating conflicts," concluded the task force, co-chaired by Brooks and retired Gen. John Abizaid. The Wahishi operation underscored a little-understood trend of the drone war: Most "high value targets" have been killed in what are known as signature strikes, in which a missile is aimed at a group of militants whose identities aren't confirmed until after they're dead, U.S. officials have said. 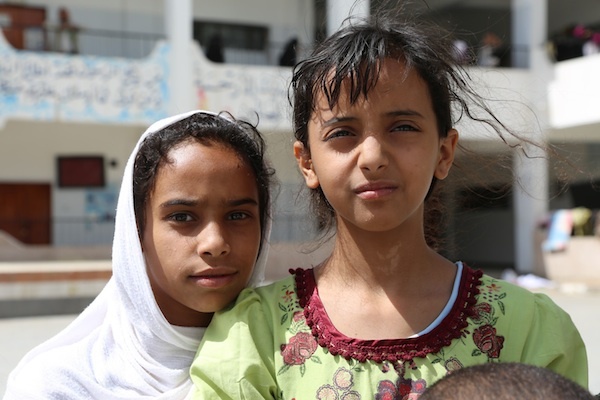 PHOTO: Children in Yemen from The Guardian's Photo Essay: Yemen's Humanitarian Crisis. The CIA didn't know at first that Wahishi was among the men it had targeted, said three U.S. officials, none of whom would be quoted by name discussing a covert operation. Administration officials had once signaled they would cut back on signature strikes, which pose a higher risk of killing the wrong people, including civilians. But the evacuation of the embassy in Yemen and the CIA's absence in Syria mean such strikes will be more common, the U.S. officials said. Even when they succeed, they are insufficient, experts say. Drone strikes "do not defeat terrorist organizations," said Seth Jones, a counterterrorism analyst at the Rand Corp. think tank. Yet many critics of Obama's approach are calling for a deeper American involvement against the Islamic State. Many military analysts, for example, say U.S. special operations troops should be allowed to direct air strikes and embed with local units on the Syrian and Iraqi battlefields, something they are not now doing. Others argue that U.S. should take military action to remove Syrian President Bashar Assad, a magnet for extremists who want to fight him. The administration has resisted, citing the lessons of Iraq and Afghanistan, where yearslong U.S. occupations failed to defeat extremists or instill stable democracies. President Barack Obama has acknowledged that the U.S. cannot kill its way to victory over terrorism, and has said his strategy also calls for addressing poverty and political repression, as well as training local forces. "We need all elements of national power to win a battle of wills, a battle of ideas," the president said in June 2013. But the U.S. so far has not proven adept at any of that, counterterrorism experts say. The more hopeful case may be in Somalia, where U.S.-trained forces pushed the al-Qaida affiliate out of some territory it once held. But the group is still mounting lethal attacks on civilians. In Afghanistan, the jury is still out on whether Afghan security forces can keep the Taliban from re-taking major cities. In Iraq and Syria, efforts to train forces capable of ousting the Islamic State group from its strongholds have ranged from slow to ineffectual. In Yemen, the U.S. for a while had a sympathetic government that allowed American drone strikes while deploying its own U.S. trained troops to fight al-Qaida. But a U.S. concentration on counterterrorism to the exclusion of political and social problems destabilized the country, Sedney and others argue, contributing to the government's fall. The lesson of the 9/11 attacks, said Bruce Hoffman, a terrorism expert at Georgetown University, "was that these groups are the most dangerous when they have a sanctuary. The fact of the matter is they have far more sanctuary today than they had a decade and a half ago." "It's dangerous," Hoffman added, "to wrap ourselves in this false security blanket that we've prevented them from attacking the U.S. thus far."